Chromacryl Clear Gel Medium is a clear medium extender that changes the coverage quality of paint and ink to achieve colour glazes without affecting pigments. 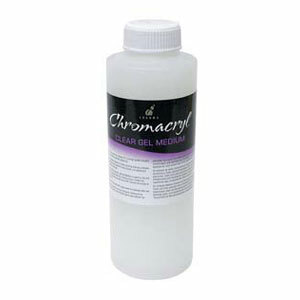 Chromacryl Clear Gel Medium is ideal for monoprinting and overprinting. Use as a paint extender, for transparent glazing or as a release agent when applied to a surface prior to paint application. Chromacryl Clear Gel Medium can also be used as a reduction paste in silkscreen painting.